As a backup plan, in case I cannot get the AUS charger I am working on fixed, I am interested in purchasing a 2nd hand one from the USA. So Far, I've not been able to find any stock in Australia. When I contact 2nd hand sources in USA, Even if I have USA part numbers for the chargers, like 9499D991 and 9499C662, (provided to me by JRAY3 and KIEV earlier) They seem to only want to talk to me if I also supply them with a VIN number for the car. The VIN number for my cars in Australia are no good to use as they cannot look these up in their USA Databases. It seems that I am currently having problems using my Private Messages on this forum. I just tried sending a PM to jray3 and it sits in the OUTBOX, but never goes to the SENT box, so I don't know what needs to happen to get it to move out of the outbox. Also jRAY3, if You have sent me VIN info, I haven't received any PM's in last few days, so maybe the receive is broken too. I don't know if it violates any rules or privacy, but if someone could post me a USA VIN Number for a 2012 IMIEV , and confirm the part number of the charger used in it, I can use that info as an alternative to source a replacement charger out of the USA if I need to. This is not a good idea for a few reasons. Firstly, I think that 3 VAC (4.2 V peak, about 3.6 V peak after the diodes) is too low. I'm more used to MOSFETs, but I believe that IGBT gates are similar. They usually use 12-15 V square waves with carefully controlled rise and fall times. Secondly, it has a very non-square wave shape. IGBTs don't like to be in the linear region between saturated and fully cut-off, since they will dissipate much more power in the linear regions. Lastly, the switching frequency of 50 Hz will be far too low. The transformers will be designed for a switching frequency of at least 10 kHz, possibly around 25 kHz or more. If driven at 50 Hz, the transformer will saturate after a few microseconds, and this will cause its inductance to decrease drastically and the current to increase drastically. This will almost certanly lead to destruction of the IGBTs. As you mentioned, you'll want to disconnect the existing gate driver circuits if you attempt anything like this. This would be not only to prevent confusion over the results from "interference", but to prevent destruction of the gate drivers as well. These are strong semiconductors, capable of several amps of current into the gates, even if only for less than a microsecond. Driving them the wrong way for up to 20 ms at a time will almost certainly destroy them as well. There may well be series gate resistors on the main PCB that could be removed for this purpose, however. So: nine out of ten for lateral thinking, and ten out of ten for seeking advice first, but unfortunately this isn't the way to test the IGBTs. skylogger wrote: There are common audio transformers quoted as 1K PRI to 8R SEC ratio but they probably don't have the 350-400v rating. skylogger wrote: It seems that I am currently having problems using my Private Messages on this forum. I just tried sending a PM to jray3 and it sits in the OUTBOX, but never goes to the SENT box, so I don't know what needs to happen to get it to move out of the outbox. This forum uses phpBB software. It's a little unusual in that messages don't move from outbox to sent box until the recipient reads the message. So it's a way of letting the sender know whether or not the message was read. It sounds like IGBTs are just opposite of transformers, in that you want to apply a square wave to the IGBT so its quickly cut on and off, so you don't waste power in heating up the device, but transformers prefer sign waves for best tranfer between primary to secondary. quite a bit of difference between this IGBT for this DC to AC, and the Pure sign wave MOSFET Inverters. skylogger wrote: What do you think of using a 555 to generate gate test signals? I've adjusted the resistor values to give a close to 10khz frequency square wave output. The transistor inverts signal so high side and low side get 180 deg switching. First, 555s, while strong, may not have sufficient rise and fall slew rates. Gate series resistors are usually around 22-47 ohms, not 1K. A 1K pullup is not good; it's far too slow. Outputs need to be push-pull. Really you need a proper gate driver chip. You also need to isolate the drive for the upper transistor. As soon as it turns on, its emitter goes wildly positive, so to keep it on you will need a gate drive that goes more positive than the emitter. This requires boost diodes. If you don't do this, the gate will go hundreds of volts negative with respect to the emitter, which will surely destroy it. But finally, and perhaps most importantly, you need guaranteed dead time. IGBTs and MOSFETs take time to turn off; tens of nanoseconds or more. They also take time to fully turn on, but you can't rely on one being slower than the other. So merely inverting the low signal for the high switch isn't good enough. The dead time is to prevent "shoot through", where the upper and lower transistors are conducting at once, shorting out the power supply. Even if you have a current limited power supply, those 3x680 μF capacitors can pack a lot of energy and blow up the MOSFETs. That's why I prefer to test with a ~50 V current limited supply; the energy in the capacitors (=½CV²) is 64x less with an 8x lower supply voltage. 52 V at the mains terminals turns out to be enough to turn on the power supply for the Elcon chargers. Maybe we can find a similar test voltage for the iMiEV chargers, or find another way to power the control circuit and test with about 12 VDC current limited. What might work is four 555 timers (say two dual 555 devices). Connect them to trigger off the previous timer's falling edge, with the first one triggered by the last one in a sort of ring oscillator. Initial conditions will be tricky. Arrange the times as say 30 μs, 1 μs, 68 μs, and 1 μs. The two 1 μs timers are for the dead time; they don't connect to gates. The 30 μs and 68 μs outputs connect to say upper and lower gates respectively (only drive one pair for initial testing). So you should get 30 μs high and 68 μs low, representing a 30% pulse width modulation (total period is 30+1+68+1 = 100 μs, or 10 kHz). You'd still need an isolated driver for the upper transistor, so you might as well use a proper gate driver chip. You likely don't have one of those at home, and Jaycar etc likely won't have one you can buy off the shelf. 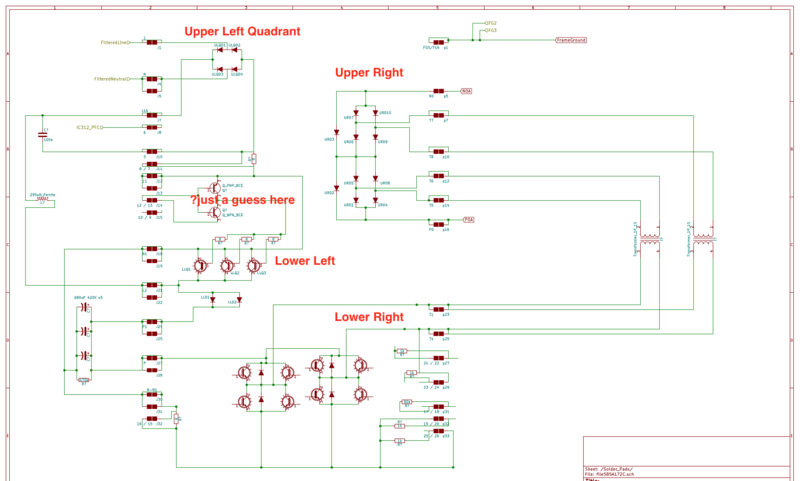 So the next thing might be to trace the driver circuitry, and find out where they are driven from, and connect their inputs to the four 555 circuit. It's starting to sound pretty complex. You will also need to ensure that the driver chips are powered up. That might be as simple as supplying 12 VDC or perhaps 14 VDC from a power supply. The power supply for the drivers seems to come from a circuit near the yellow-taped transformer that's on its own. But I don't see how it gets power; it could be 12 V coming through the very fine ribbon cable connecting the top board to the charger board, or more likely from the PFC output (400 V bus). It's likely a high frequency power supply as you'd find in a small plug-pack (wall wart) power supply these days, using the boosted mains voltage rather than merely rectified mains. If so, it depends on the design how low in voltage it will work at. It might be easier to find the outputs of the power supply and supply from a bench power supply, rather than use the power supply in the charger. KIEV: Thanks for all those VIN numbers, with all of these, surely the 2nd hand parts places should find a database match. are all of those 2012 models or are they different year models? COULOMB: Looks like creating a test circuit is way harder then I thought. Maybe when the charger is running in the car, CANBUS communications is received which somewhere on the controller PCB is translated to a high/low enable signal for the section that controls the driver timing circuit. If we can find that, we can force it high or low similar to the jumpers on the other chargers that you have worked on previously. Another idea would be to use the testing transformer idea I first posted, but with a 24v center tap, so you get 2x 12v signals, and then put each of these half wave signals to a Triac, Like motor speed controllers use. This would allow fire the triac when it reached a trigger set point. This chopping would also create the dead time gap needed to make sure the High and Low sides are switched off completely before the next cycle. You would end up with a chopped 12v square wave but still some round at the top. i tried to correct and add components seen in the x-cavation. i numbered the semiconductors starting from left to right by their physical location in each quadrant. It looks like a push-pull drive circuit for the PFC "FETs" in the lower left quad, but this is just a crude guess since we don't really know what is under there. i think the positive drive voltage come in thru pin 13, so maybe that could be checked to see what is present on that pin. pin 12 might be the drive signal from the PFC control chip, IC312, TI UC2854, which does have a 1A push-pull output. There appears to be a couple of current sense resistors, so they were added but the values are unknown. From your in-car testing, and the current measurement, it seems as if the AC input relay is not being commanded, or it is bad. Be careful with the testing, it will be very difficult to replace or repair semiconductor parts on the waffle plate. Let me know what is highest priority and i'll focus on that aspect of tracing. kiev wrote: i tried to correct and add components seen in the x-cavation. Ah. In my post, I meant X-cavation to mean the exacto knife process, but it can stand for the X-ray photos as well I guess. It looks like a push-pull drive circuit for the PFC "FETs" in the lower left quad, but this is just a crude guess since we don't really know what is under there. Good guess I think. I had noticed that area and not figured out what it could be. i think the positive drive voltage come in thru pin 13, so maybe that could be checked to see what is present on that pin. I think you are right, but have the NPN and PNP driver transistors reversed. Yes, it would be good to know that the voltage is on pin 13 with respect to pin 11.
pin 12 might be the drive signal from the PFC control chip, IC312, TI UC2854, which does have a 1A push-pull output. Great to know. So it would also be good to know if there are pulses on pin 12 with respect to pin 11 (using dual trace and diff). Brilliant! I was thinking that these were capacitors, and could not make sense of the thin wires. Every PFC circuit needs to measure current, so the mains current will stay in phase with the mains voltage for near-unity power factor. This will be the feedback. It's in the negative leg of the power circuit, for ease of measurement. 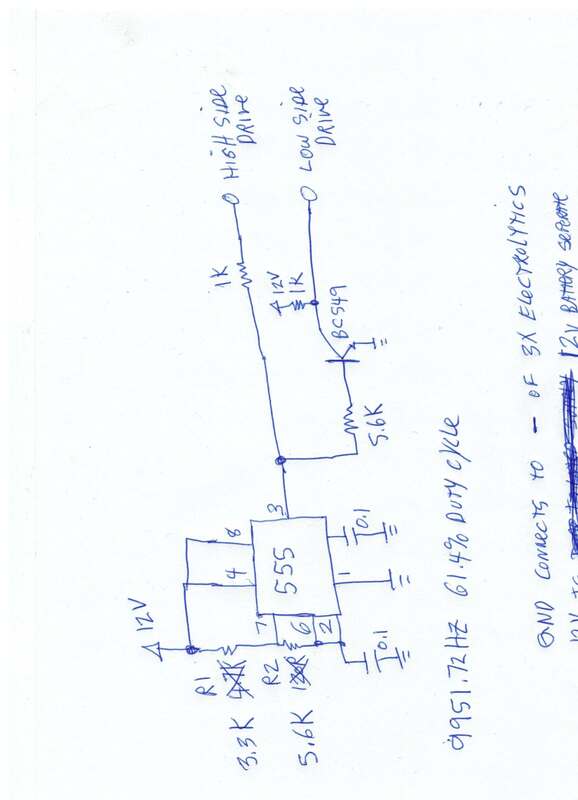 So I believe that your shorting of pins 8 and 7 is incorrect, it will be the shunt resistors (two in series). To measure it, I'd apply 1-5 A from a current limited lab power supply to pins 5 and 11, and measure the voltage drop with a multimeter, probably on the millivolt scale. Then just use Ohm's law R = V/I. They provide the Kelvin connections to make this accurate. I was still thinking that the low voltage measured could be across the inductor, but thinking about this more, I tend to agree with you now. There is no significant current being drawn, apart from narrow pulses to charge the capacitors, and whatever voltage there is across the unknown impedance it will still scale with mains current. There will at least 100x as much current at full load, and you can't have ~150 V (1.57 x 100) dropped across that impedance. So this must be the pre-charge resistors, and the input relay must be unenergised, or its contacts open circuit. So @Skylogger, you need to make sure you don't cause any significant power to be drawn until that issue is settled. Your pre-charge resistors apear to be intact at this point, but they won't stay that way if you start charging the pack for real with the input relay turned off. Thanks as always Kiev for your thoughts.